There can be a right time and a wrong time for launching a business. Retail based business ideas can be great, but there are many downsides these days with how the internet and other factors are changing the retail shopping landscape. It’s important you pay attention to the timing of markets. You can have a great idea, but if the timing is off, you’ll fail. And 2019 has continued to show that trends in the retail space will continue their path. Just look at the picture below. 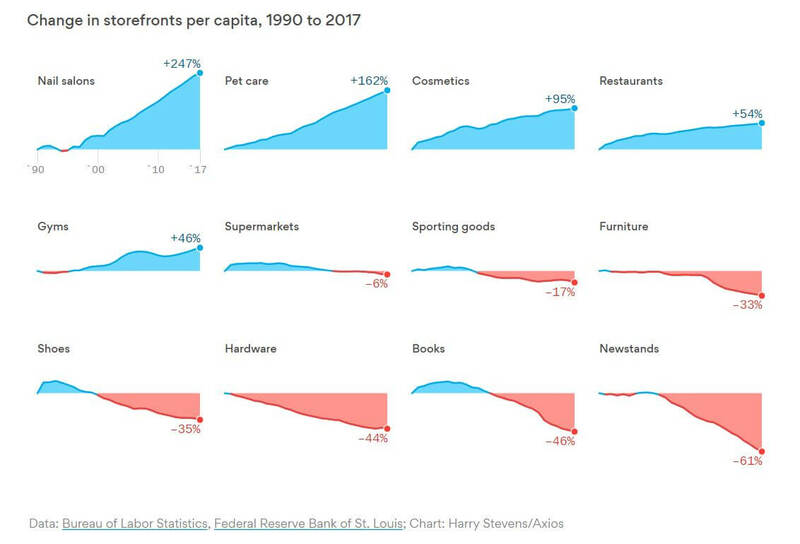 You’ll see how certain industries in the retail space are facing an extreme decline in revenues (research by Axios). Now, take a look at the industries in retail businesses that are thriving. These industries provide a lot of value to the customer and we are going to explore how with the successful industries. They have continued to show strong growth because these environments provide a lot of value to people through feeding them and experiences. Many people enjoy going out to eat because they get to have some great food and possibly drinks too. Also, they may have more enjoyable environments with softer lighting and live entertainment. Nail salons have seen the highest growth between 1990 to 2017 for retail storefronts, and that is because they make their customers feel pampered and beautiful. When they go to get their nails done, it may be a great social experience too as they get to chat with their nail technician or just simply relax and de-stress. These environments are usually set up to be quite comfortable too, with some having massage chairs as well as giving hand massages to their clients. As it sounds, if you’re interested in getting your nails done it sounds like a great experience. People have a need to care for the things they love, especially pets. And people spend an exuberant amount of money on their pets. American Pet Products Association estimated that people in the United States spent approximately $72 billion dollars in the pet industry for 2018 alone. Many pet owners like taking their pets into the retail stores because they get the chance to see if the certain dog begs fit for their dog, if they like the toys you’re going to buy, or if the clothes will fit the dog. There are many examples of people shopping with their pets, an experience that can’t always be done online. Working out is another experience that cannot be transferred to an online experience. Although more people could spend time working out at home, gyms provide a value-added environment where people get to work on themselves. People usually leave the gym feeling happy due to the body releasing endorphins from exercise. As well as feeling more confident because you may like the way you look after your workout too. A common theme among those five thriving industries is that they provide an experience for their customers when they leave the home. These places make it pleasant for people to spend their time, which now is proving to be more important than the amount of money a customer will spend. If you can get them to spend their time with your business, that is a success too as that will build over time to more money being spent because of brand loyalty. How can I make my retail business idea a place where people want to spend time? Another common theme is that internet has allowed these businesses and business models to thrive by driving people to their store fronts. Whereas the dying industries like the furniture stores, shoe stores and hardware store are being over-taken because the online experience is much better and preferred. What business ideas do I have that can be complimented by the internet and technology, and not overtaken? The last key theme among these thriving retail businesses is that they provide value in the person feeling better about themselves. A restaurant will provide a great meal and that person will be full and happy. The nail salon may give someone new confidence because of their fantastic new nails. And a gym allows someone to get into shape and better their health. How can I make my retail business idea an experience that allows the customer to better themselves and feel good about themselves? Just think about it. Think of a time when you went to go buy shoes in the mall. First, you need to spend time getting to the mall and finding parking if you drone. Then, when you first walk in, you’ll have to walk half a kilometre to find the shoe store you are looking for. And finally, when you reach the store to buy shoes, you’re bombarded with sales tactics to get you to buy everything in the store. It’s not as a pleasant experience as ordering something online in the comfort of your home. There are usually more deals found when doing online shopping as well. For example, flash discounts through email marketing that you usually won’t get in store. You can see from all these growing retail industries that they create value for their customer. 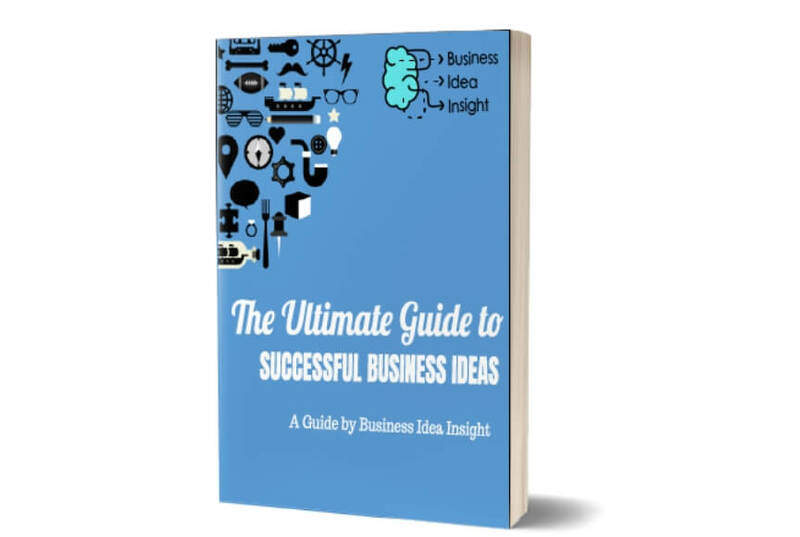 This presents two opportunities for your business ideas. Follow the trends and don’t start a retail storefront in the declining industries, and stock within the growing industries if you want a retail-based business. 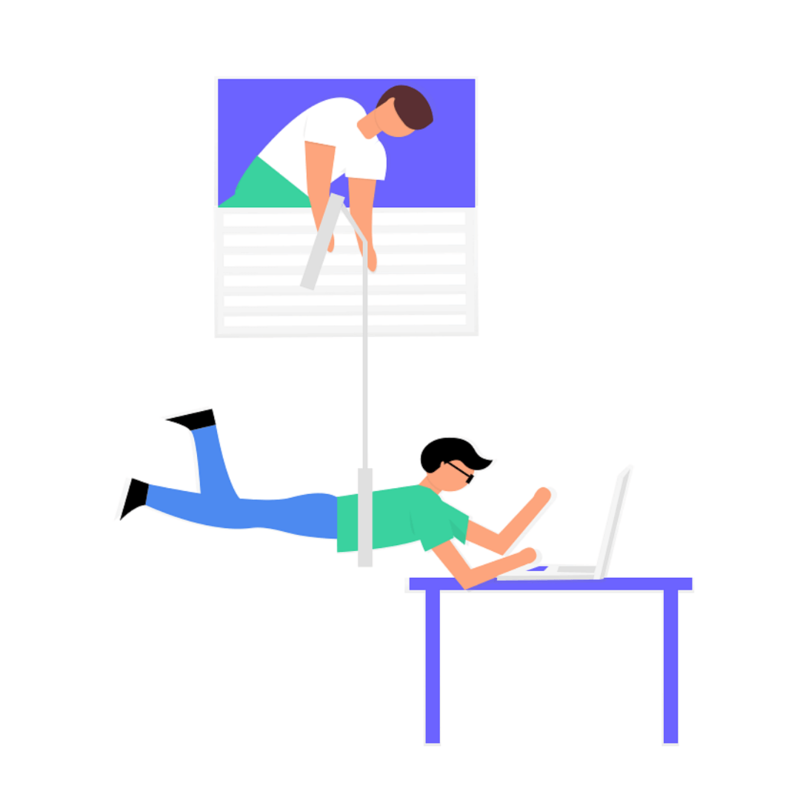 If you need help finding trends, you can use these 12 tools for discovering business idea trends. Design more engaging, fun and value-added aspects to a declining retail industry, and see how you can substantially stand out from the competition and take market share from the current competitors. Next time you sit down with your list of retail-based business ideas, ask yourself those questions I put in above, and see if the company you want to start will actually provide an amazing experience and add value to someone’s life.